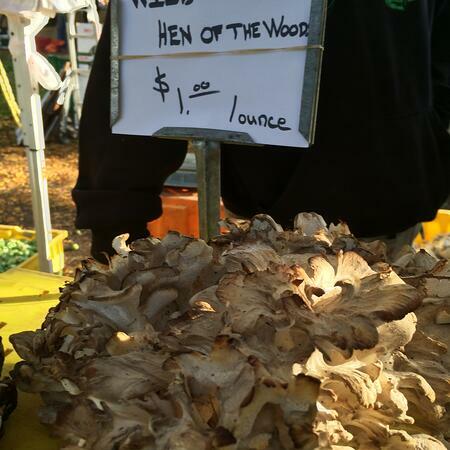 I grew up Morel mushroom hunting with my family so my love of exotic mushrooms was formed at an early age. I cherished the experience and time with my family exploring the woods and the healthy competition that ensued over who could find the most mushrooms. There was also the delight of coming home and cooking an obscene amount of mushrooms and eating them all. This was a once-a-year occasion and something I looked forward to almost as much as Christmas. The intense taste of a Morel is something I have never found in other mushroom varieties and the cultivated and dried morels are just not as flavorful. 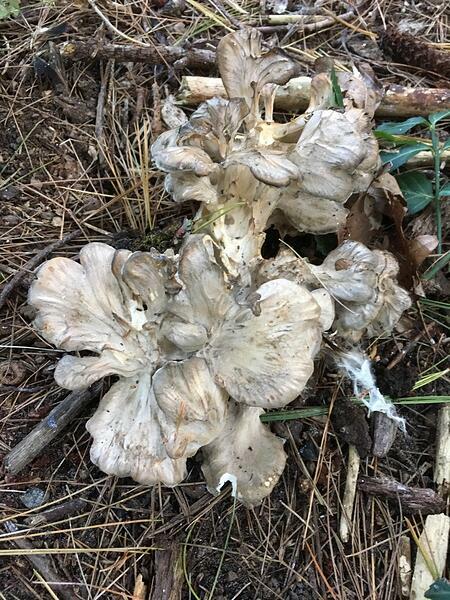 So when I discovered Maitake mushrooms (Japanese name), locally known as Hen of the Woods mushrooms, it was a moment that brought a little tear to my eye. Maitake mushrooms whether cultivated or grown in the wild are intensely flavored with a texture that even mushroom haters could get past. During my years of teaching people how to cook, I have learned that the majority of people who dislike mushrooms actually dislike the texture rather than the flavor. Maitake mushrooms do not have that squeaky texture, but rather a delicate and feathery texture. Another bonus is that they can be found through much of the year at farmers' markets, gourmet grocery stores and perhaps even in your backyard so that you can enjoy them more than just once a year! 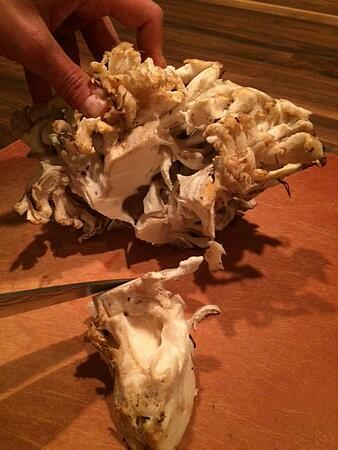 Perhaps one of the coolest things about Maitake mushrooms is that they are one of the easiest mushrooms to cook. I'm unlike most chefs because I wash my mushrooms. After all, most mushrooms are grown in manure and you really can’t “brush that off” now can you? Just make sure you wash them right before you cook them so they don’t get mushy. Maitake mushrooms generally grow at the base of dead oak trees and sometimes living ones too, so the environment where they grow isn’t that dirty so I don’t wash these mushrooms. Whether you wash or brush your mushrooms, this adds time to your prep and the lack of cleaning these provides yet another bonus. 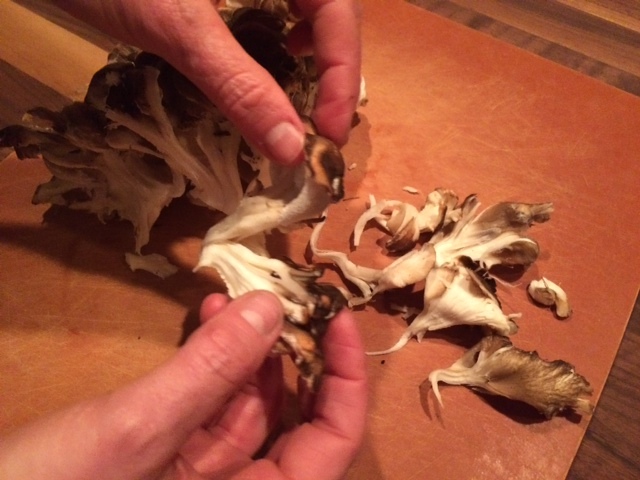 The Maitake has a white base that is a little tough and it is the piece of the mushroom that grows into the ground so go ahead and cut that part off. You can freeze it and use it in a mushroom stock later if you want. I would describe the mushroom as almost having leaves or feathers and all you really do is pull each little piece apart and sauté them, so no slicing is needed. These mushrooms can grow really big, even up to 100 pounds in Japan. So, I've been known to slice a chunk off of a big one and cook it like a steak, either grilling or sautéing the slice whole. I usually sauté these mushrooms in some olive oil and salt and pepper. Like a good steak they are so flavorful I just can’t make them taste any better than they do on their own. If I do add them to a dish, I simply garnish with them or add them to dishes like pasta, risotto or eggs. I’m always interested in finding other mushrooms that have unique and intense flavors so please share if you have any recommendation for the next mushroom I should discover! 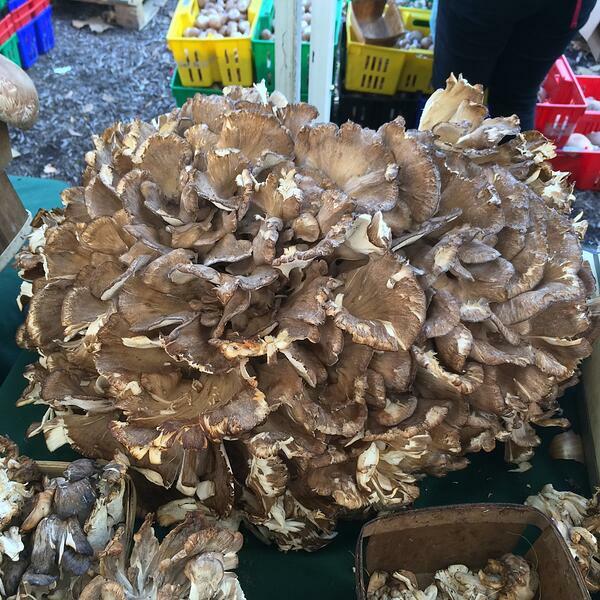 Watch my video on how to pick out mushrooms to learn more about the different varieties. Want to try growing your own mushrooms? 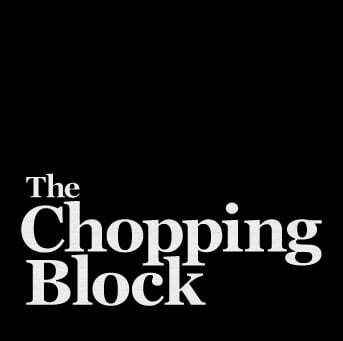 Check out The Chopping Block's Chef Mario's method for DIY mushrooms. 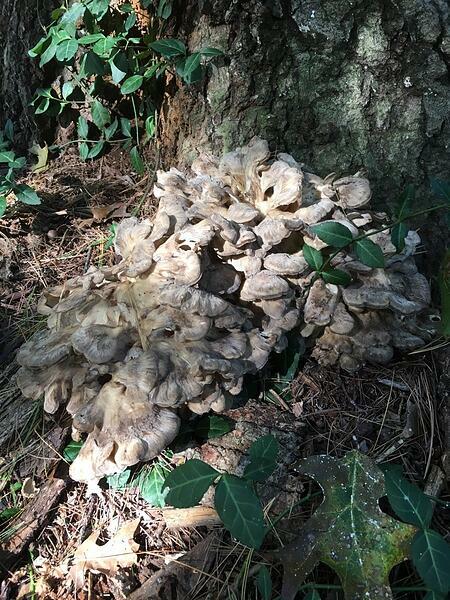 I was very excited to recently find about a 5-pound clump of Hen of the Woods/Maitake mushrooms, as well as one small half pound clump at the base of a what appears to be a healthy oak tree on my property in Michigan. This is the first time I have found them in the wild so I was incredibly excited, especially because it happened during the week of my wedding! We had the unique opportunity to serve these tasty morsels at the wedding and to share them with friends and family. 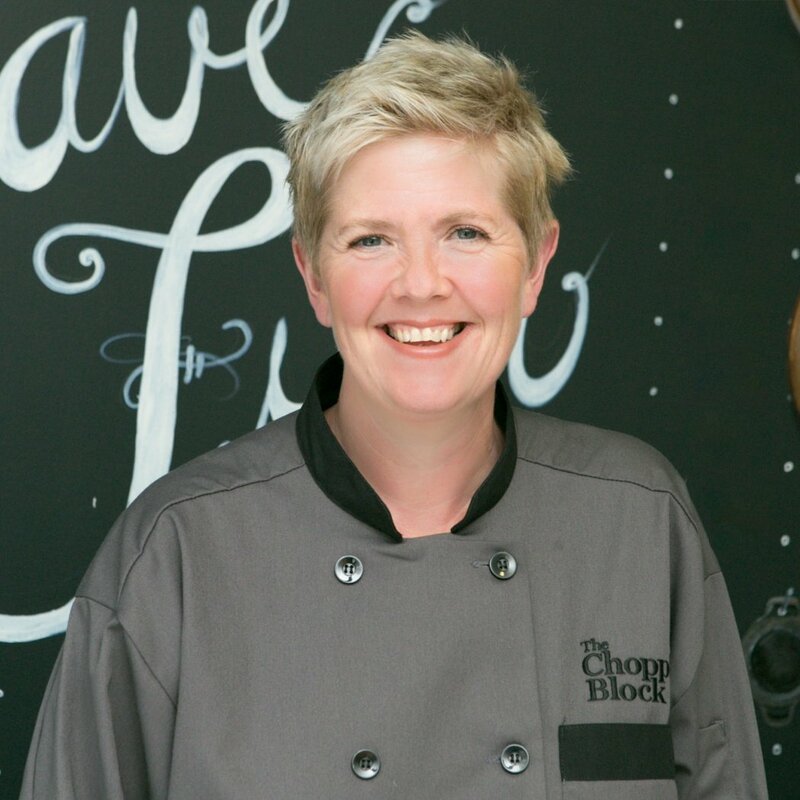 The Chopping Block chefs made our popular Mushroom Thyme Cheesecake and a green bean side dish with the mushrooms. The mushroom cheesecake might sound weird but it is a Chopping Block classic and a recipe I created almost 20 years ago when we first opened our doors in Chicago. I have always made it with domestic mushrooms so the preparation was even more special with the addition of the Hen of the Woods mushrooms. Here's the recipe if you want to give it a try. It's a perfect holiday appetizer! Prepare a 7” or 8” springform pan by coating it with a thin layer of butter or olive oil. Then coat with a thin layer of bread crumbs. 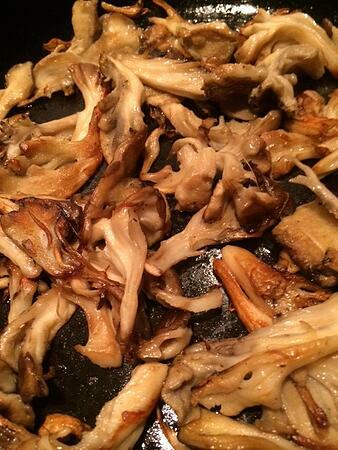 To prepare the mushrooms, heat a large sauté pan over medium high heat and add the butter and olive oil. Add the sliced mushrooms and sauté, stirring occasionally, until they have a deep golden brown color, about 10 – 15 minutes. Add the onion and garlic and continue to cook an additional 2-3 minutes. Add the thyme, salt and pepper. Deglaze the pan with the sherry and set aside. For the cheese mixture, place all of the ingredients in the food processor and mix until smooth. Pour in half of the cheese mixture into your prepared springform pan and top with half of the mushroom mixture. Repeat with another layer of the cheese mixture and finally with the mushroom mixture. Bake for 50 to 60 minutes, or until set. It will still be a bit jiggly. Wait at least 20 minutes before unmolding, so it doesn’t collapse. Serve hot or room temperature with grilled toast or crackers. I saved the one small clump of mushrooms, and I plan to dry them in the same method I've used before. I'm not entirely sure what I will do with them once they are dried, so you will have to check back in and see!